Alan Sellers loved tools! Born on June 17, 1920, in Atlanta, he was the youngest of three brothers, and his father worked for the railroad. He married the daughter of a railroad engineer, Louise Smith. During World War II, Alan served in the Army Air Force. Afterwards, he went to work in Nashville. The Sellers, along with their two young daughters, Sue and April, subsequently moved to Marietta. In the early 1950s, Alan and Louise Sellars started a retail hardware business, a hardware store with a gift shop, in Marietta. During that first decade in Marietta, Alan and Louise also began an activity that would become a passion — they began to spend many long weekends traveling and visiting antique stores. They learned about and acquired a variety of antiques — from household furnishings and kitchen implements to fine paintings and hatpins. Louise and Alan visited the artist and author Eric Sloane, a longtime collector of Americana. 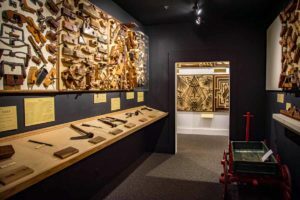 Though Alan had been collecting workshop tools, it was after seeing the new setting for Sloane’s collection of tools in a museum in Connecticut that Alan began assembling a collection of tools specific to particular trades. Many of the antiques the Sellars acquired during their travels were used to furnish and decorate the gift shop portion of the hardware store, and for many years only a select few of their favorites were displayed on the family room wall in their home. 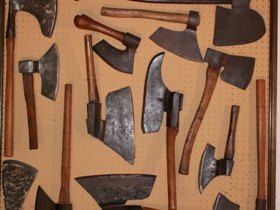 Most of the other tools were stored in boxes in the workshop behind the house. 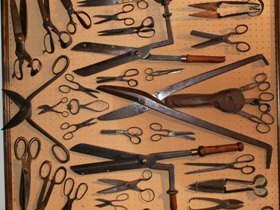 For special occasions, some of the tools were selected, displayed, and their use demonstrated at many local schools, county and state fairs. In 1978 Alan and two employees of the hardware store, Carter Butterworth and Don Dougan, began building panels to display the collection. Alan wanted to exhibit his collection to the public, and he solved the question of "Where?" by hanging the panels from the ceiling above the merchandise in his hardware store. Soon more than 120 display panels were hanging back-to-back throughout the store. The panels were in a constant state of revision and addition as Alan continued to find more items to improve the collection. In 1985, the hardware store moved to a larger building - partially to accommodate the tool collection and also to provide gallery space for the developing art collection. 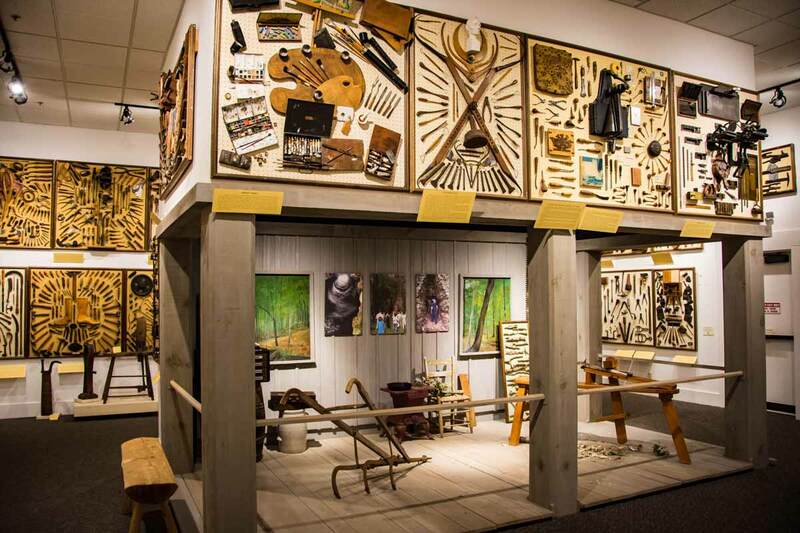 One section of the new building was turned into a tool museum, and an art gallery was made for the paintings. Mark Wright was hired to help Don and Carter with these projects. At this point many of the tool displays were edited and consolidated into a denser and richer selection totaling about 100 panels. The Sellars family felt that the tools reflected the love and care of the craftsmen who used them — the tools are living pieces of history that fit within the hand. Alan passed away on Christmas Eve of 1991, and he and Louise have given Reinhardt, and the many visitors to the Funk Heritage Center a precious gift -- part of our own heritage, preserved and presented so that we, too, might see the everyday workings of the past. Louise Sellars indicated it was always Alan’s desire that his collection become a living educational experience. She felt that by donating his collection to Reinhardt College, her husband’s wishes would be fulfilled. The collection is presented in his memory. 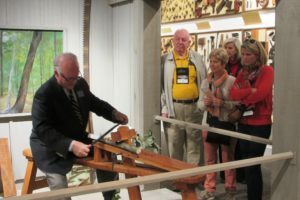 Following an adult tour, Executive Director of the museum, Dr. Joe Kitchens, demonstrated how woodworkers used a draw horse.